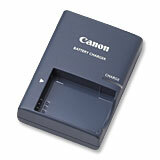 The Canon CB-2LX Battery Charger is designed to take full advantage of high-capacity rechargeable batteries. This small, compact charger has been specially designed to charge the Canon NB-5L batteries. Compatible with the SD700IS digital camera.